Martine Rothblatt, Ph.D, MBA, J.D. is one of the most exciting and innovative voices in the worlds of business, technology, and medicine. After graduating from UCLA with a law and MBA degree, Rothblatt served as President & CEO of Dr. Gerard K. O’Neill’s satellite navigation company, Geostar. The satellite system she launched in 1986 continues to operate today, providing service to certain government agencies. She also created Sirius Satellite Radio in 1990, serving as its Chairman and CEO. In the years that followed, Martine Rothblatt’s daughter was diagnosed with a life-threatening pulmonary hypertension. Determined to find a cure, she left the communications business and entered the world of medical biotechnology. She earned her Ph.D. in medical ethics at the Royal London College of Medicine & Dentistry, and founded the United Therapeutics Corporation in 1996. The company focuses on the development and commercialization of biotechnology in order to address the unmet medical needs of patients with chronic and life-threatening conditions. Since then, she has become the highest-paid female CEO in America. In 2004, Martine Rothblatt launched the Terasem Movement, a charity endowed for the purpose of educating the public on the practicality and necessity of greatly extending human life. The group focuses on the possibility of technological immortality through processes such as mind uploading, nanotechnology, and advanced robotics. 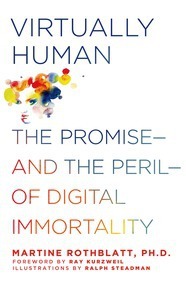 These topics are explored in-depth in Rothblatt’s latest book, Virtually Human: The Promise – and the Peril – of Digital Immortality, which examines how close we are to achieving a full simulation of the human brain via software and computer technology, also known as cyberconsciousness. The Terasem Movement demonstrated this concept with the construction of BINA48, an intelligent robot based off the personality and appearance of Bina Rothblatt, Martine’s wife. BINA48 was profiled in The New York Times, GQ, WNYC Radio, and other media outlets. Martine’s public service activities include representing the radio astronomy community in its efforts to secure quiet frequency bands for astrophysical research, developing improved medical ethics for transgender health service providers, and leading the International Bar Association’s effort to provide the United Nations with a Human Genome Treaty. She is also the author of numerous books on communications, bioethics, politics, and transgenderism. The Huffington Post reports on a fireside chat with Martine and Michael Houston. Dr. Martine Rothblatt sits down with the Washington Post to discuss SiriusXM, religion, and biotech. Check out more interviews with Martine from the Daily Mail, the New York Post, Inc., Business Insider, and CBS. The New York Observer examines Dr. Martine Rothblatt’s work in the robotics field. "The dinner with Dr. Rothblatt was a big success. The conversation was very engaged and authentic. There's even partnership potential." "Dr. Rothblatt was a truly engaging speaker. She was deeply personal in the stories she told, which captivated the audience. Her speech was a moderated discussion with a member of our school’s administration, which allowed Dr. Rothblatt to cover a wide variety of topics, from the development of the Sirius Radio technology, founding United Therapeutics to save her daughter’s life, her work as a futurist with artificial intelligence, and living as a transgender woman. This variety of topics really made for a fascinating evening and the audience definitely enjoyed her entire presentation. She was also extremely gracious and welcoming to the audience. I think she answered every audience question there was, and stayed to greet those that had last minute things to ask before she had to depart for her train. As someone unfamiliar with topics of Pharma companies and radio waves and artificial intelligence, I felt that she explained these complicated topics in easily understandable ways, such that I would like to learn more about those topics and Dr. Rothblatt’s work. Overall a truly incredible speaker and individual, one of the best presentations I have ever seen." "Exponential technologies are driving a new dimension of human evolution. In her compelling book, Virtually Human, Martine Rothblatt outlines how artificial consciousness is just around the corner, and explores the scientific and ethical ramifications. Science fiction is rapidly becoming science fact and the implications are breathtaking. Virtually Human is critical reading to anyone who plans to be around for the next couple of decades." "We are in the midst of a war between biological and electronic brains for dominance in our hybrid population. Bio-brains are, so far, ahead based on their inventiveness, energy-efficiency and exponential improvement rate. Will ethics asymmetrically restrict engineering humans or will it equally apply soon to ‘virtually human’ electronic brains? Martine’s insights on these and many other topics are timely and welcome." "Virtually Human is a fascinating read that clearly brings Alan Turing into the 21st century. I have argued that we are DNA-software driven machines and as we expand digital-biological interconversions, Martine’s "mind clones" and functional avatars are a logical outcome. Only by attempting to recreate models of humans will we truly begin to understand ourselves. Virtually Human is a great beginning." "In Virtually Human, Martine Rothblatt builds on the observation that "I think, therefore I am" in ways that Descartes could not have imagined. With the rapid evolution of artificial intelligence, Rothblatt predicts that we soon will confront cyberconsciousness comparable to—indeed, indistinguishable from—the human mind. When we cross this technological Rubicon, we will be forced to reconsider the meaning of concepts as foundational as life and death, law and liberty, love and kinship. Bringing to bear the lessons of history, philosophy, psychology, law and science, Rothblatt makes abundantly clear that these unprecedented challenges will define the humanity not just of our technological doppelgangers but of ourselves."